I must confess I have become a little obsessed with coffee recently. I never understood how my mom could drink coffee at all times of the day until now. 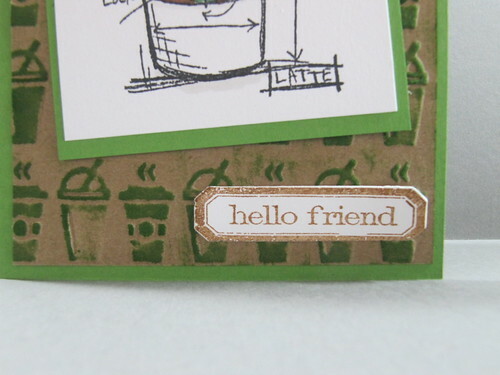 In honor of my coffee loving ways I broke out this little stamp/die/embossing folder set I got from Sizzix. 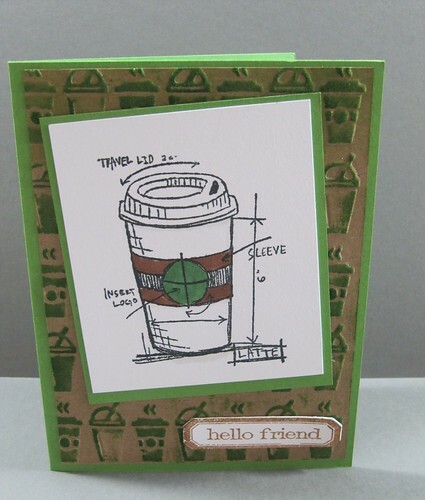 The stamps are one of the Tim Holtz coffee blueprints. 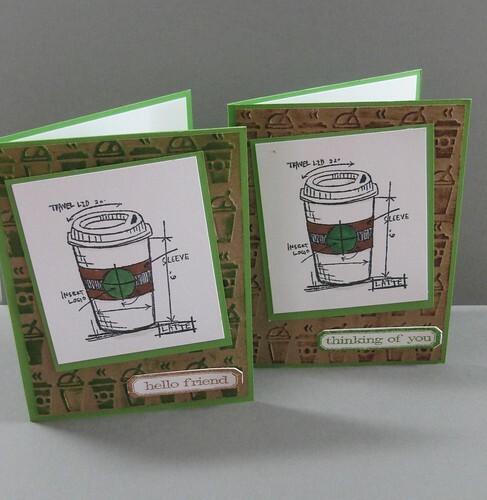 After I embossed the mini cups on a kraft piece of paper I direct inked the raised edges. First I tried it with green. I wanted to bring out the green from the cup. I finished this one with one of the sentiments and the matching die. I used my misti to stamp everything. A few weeks ago while I was pinteresting I came across a blog post (unfortunately I don't remember where) about how the blogger had cut up a Sizzix Eclips mat to fit inside her misti for when she wants to stamp on die cuts that are too small for the magnet. I have been doing that ever since. It works great! After I did the embossed piece in green I wanted to try it with a brown. I pulled out my old trusty Vintage Photo distress ink. This has been my go to brown since I bought it. I used the direct to paper method again. I tried sponging the ink on but it was getting too much ink on the parts that are not raised. 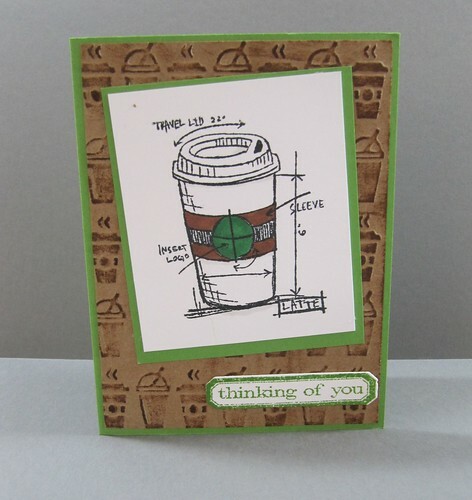 I finished this card off with the other sentiment stamped in Mowed Lawn distress ink. I felt these would be perfect for the Simon Says Stamp Wednesday Challenge Bit O' Green. Beautifully crafted! love the textures and design! Thanks so much for playing Simon Says Stamp Wednesday “Bit O’ Green” Challenge! Beautiful colors and design. Well done!